A WOUND IN TIME: THE EVOLUTION OF "A WOUND IN TIME"
More than 20 years ago I was a member of a resident playwright at an arts organization in the East Village. 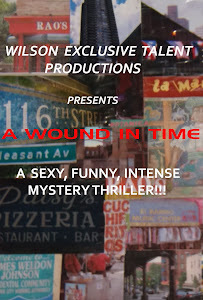 I wrote "A Wound In Time" while there and it had it's first staged reading. One of the members of the acting pool was Ella Joyce who would later have her own TV series (Roc) and star in films and on Broadway (Two Trains Running). She read the role of a Santeria Priestess. Just last year I picked up the script for the first time in many years and adapted it into a screenplay while revising the play. The screenplay became a semifinalist and quarterfinalist in two recent international screenplay competitions. Last week I had a staged reading for the screenplay and in October I will be producing and directing the play at the legendary Nuyorican Poets Cafe. I am hoping to nest there until the Spring before making the move to Off Broadway if it does well. I will be holding auditions in July and presale tickets will be available on the Nuyorican website in July.